Super Smash Bros. for Nintendo Switch? 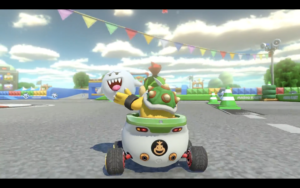 Mario Kart 8 Deluxe is an upgraded, Nintendo Switch version of Mario Kart 8 from the Wii U. It renders at 1080p in tv mode, and 720p in handheld or tabletop mode. The game features new characters, new vehicles, new items, and a revamped battle mode. Like the Wii U version, You race on land, underwater, in the air, and on the walls, as you race against your opponents, avoiding shells and banana peels. Mario Kart 8 Deluxe adds some new features while racing. For beginners, they added Smart Steering, which helps you stay on the track. Auto accelerate saves your thumbs from pressing and holding on the accelerator button. This time around, you can brake while drifting, which helps you make those sharp turns. You can also hold 2 items at a time, and the double item boxes from Double Dash make a return. Finally, is the ultra mini turbo. When you have smart steering turned off, you can perform a third tier of drift boost, that lasts longer than the super mini turbo. 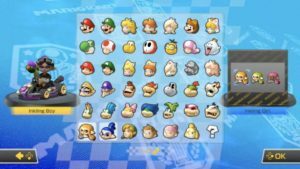 In Mario Kart 8 Deluxe, every character, including the downloadable ones, are available right from the start. There are 6 new racers, with one you need to unlock. The new characters are King Boo, Dry Bones, Bowser Jr., and the Inkling boy and girl from Splatoon. There’s a special character to unlock if you can beat all the Grand Prix cups on 200cc at 3 star rank. Trust me, it’s quite the challenge. 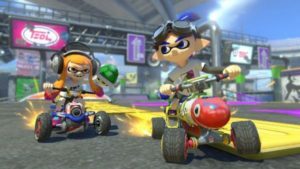 Mario Kart 8 Deluxe also adds 3 new vehicles. The Koopa Clown makes it’s return from Mario Kart 7, with brand new bells and whistles. 2 of the newest vehicles are inspired from Splatoon, the Splat Buggy and the Inkstriker. You have to unlock kart parts by collecting coins, which can get annoying if you already did all that on the Wii U.
Mario Kart 8 Deluxe has a reworked battle mode, which makes up for the previous game’s lackluster battle mode. You can play classics like balloon battle, shine thief, and bob-omb blast. There’s a new battle mode called renegade roundup, which is a cops and robbers inspired game mode. The Boo item returns to Mario Kart 8 Deluxe, turning you invisible and stealing items. Exclusive to battle mode, the feather also returns from Super Mario Kart. This lets you jump high to avoid items or even steal a balloon. Mario Kart 8 Deluxe is much more than a Switch port of Mario Kart 8. It’s a brand new challenge for newcomers and veterans. It is an absolute blast. I give it 5 stars.